The most difficult challenge to face by a hospitalist in regards to invasive mechanical ventilation are when to intubate, what setting the ventilator should be set at and troubleshooting the ventilator. A hospitalist will need to identify when a patient needs intubation and then be able to successfully select the correct ventilator setting to best suit the needs of the patient and subsequently troubleshoot the ventilator when things go wrong. A good rule of thumb is if you are considering intubation for a patient then you should probably intubate the patient. Non-invasive ventilation (Bilevel Positive Airway Pressure or BiPAP) should only be implemented in patients that have immediately reversible conditions such as pulmonary edema or chronic obstructive pulmonary disease (COPD) exacerbation. Patients with respiratory failure that have conditions requiring more than a few hours to recover are better candidates for mechanical ventilation (e.g., Pneumonia requiring intravenous [IV] antibiotics). Initially one should start with either AC or SIMV. Volume control is a good mode for patients that are more sedated; especially for underlying pulmonary disease (high likelihood of fighting the vent in awake patients). Pressure control is good for patients that are more awake (most comfortable mode for the patient). SIMV is an excellent mode for younger patients with good respiratory function. It helps work the respiratory muscles as patients are able to initiate their own breaths but ventilator provides minimum mandatory breaths as well. This may depend on why the patient needed invasive ventilation. If it was for airway protection, then start with a normal respiratory rate. If it was for impaired ventilation, consider a higher respiratory rate. If the patient has obstructive lung disease, then you may want to start with a lower respiratory rate to avoid Auto-positive end-expiratory pressure (PEEP). Most patients can be started at 6-8 milliliters/kilogram (ml/kg). For patients with Acute Respiratory Distress Syndrome (ARDS), initial tidal volume should be set at 4-6 ml/kg to maintain peak pressures < 30 millimeters mercury (mmHg). If using SIMV then you must select a pressure for the pressure support breaths which should be started between 5-15 centimeters water (cm H2O). What you pick should be based on about how much tidal volume you would like the patient to receive on breaths they initiate outside of the pre-set breaths. While setting this consider the elasticity of the lungs and how much effort the patient will need to generate – weaker patients will need more pressure support. Inspired oxygen concentration should be set at 1.0 and lowered according to oxygen saturation measurements and arterial blood gas measurements. Goal oxygen saturation (SpO2) > 90% and partial pressure oxygen (PaO2) is > 55 mmHg. PEEP helps open up the alveoli and improves oxygenation. Generally a PEEP is set at 5 cm H2O. 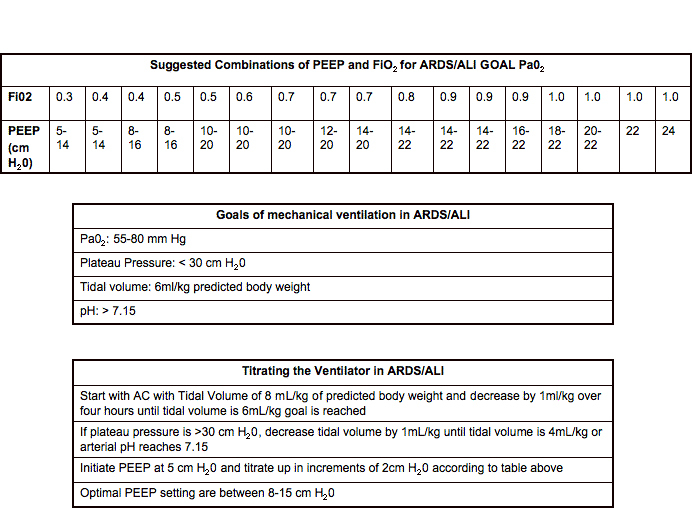 ARDS patients require higher PEEP. Initial tidal volume should be set at 6-8 mL/kg and minute ventilation should be adjusted to keep pH at low normal. These patients often have compensated baseline hypercarbia. Remember that gas from the ventilator will follow the path of least resistance and therefore the non-diseased lung may get injured from overdistension and may actually worsen ventilation-perfusion ratios. After the initial settings are selected, one must be prepared to make changes and troubleshoot. It is important that when making adjustments that the target is to correct pH and not partial pressure carbon dioxide (PaCO2). Results when patient physiology and ventilator setting result in an inadequate expiratory time and is common in patients with obstructive airway disease. Treatment is to disconnect the ventilator and allow the patient to exhale, then reset the ventilator to increase the expiratory time either by changing the inspiration:expiration ratio or decreasing the frequency of ventilator breaths. With positive pressure ventilation, venous return to the right atrium is decreased which may cause left ventricular pre-load, stroke volume, cardiac output and blood pressure to decrease. Treatment is to disconnect the ventilator and allow the patient to exhale then reset the vent to increase with expiratory time either by changing the inspiration:expiration ratio or decreasing the frequency of ventilator breaths. 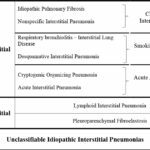 Stress from the underlying cause of respiratory failure and/or the intubation itself may cause cardiac ischemia. Generally speaking it is acceptable to have moderate hypercapnea (50-80mm Hg) especially if the patient has ARDS. Again, goal should be to maintain pH > 7.25. There is a tendency to wait too long for intubation. This is a dangerous pitfall since elective intubation carries far less risk than emergent intubation. It is important to get control of a patient’s airway if they are unstable or heading towards respiratory failure. It is also important to not cause injury with the mechanical ventilation. One important measure is to not hyperinflate the normal lung regions in patients who have acute respiratory distress syndrome. The way to prevent this is to set tidal volume at 4-6 mL/kg of ideal body weight. No national standard/benchmarks established yet.